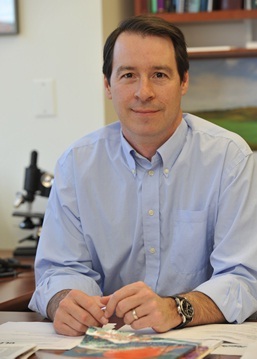 Peter Tontonoz, MD, PhD, is working to understand how lipids regulate cellular physiology and influence the development of metabolic disease. His work has uncovered fundamental mechanisms involved in the control of cholesterol homeostasis and helped to define new connections between lipids, their metabolism and immune responses. The dissection of these pathways is not only advancing the understanding of basic biological processes, but also highlighting potential opportunities for therapeutic intervention in human diseases. Dr. Tontonoz's research has uncovered a new pathway for regulation of blood cholesterol levels that may lead to new strategies to treat heart disease. High levels of plasma LDL cholesterol (bad cholesterol) are a strong risk factor for atherosclerosis. A major indicator that determines the levels of LDL circulating the blood is the level of expression of the LDL receptor (LDLR). LDLR on the plasma membrane of cells binds to circulating LDL facilitating the clearance of LDL from the blood. Thus, higher levels of LDLR expression lead to less LDL in the blood and reduced risk of cardiovascular disease. Statins, a well-known class of lipid lowering drugs, act by increasing LDLR expression in the liver. Tontonoz's study of the nuclear receptor LXR, has discovered a new mechanism by which the level of cholesterol in a cell's feedback inhibits the expression of LDLR. Identification of a protein called IDO (Inducible Degrader of the LDRL) that targets the LDLR for degradation, thereby blocking LDL uptake, may lead to the development of new drugs to lower cholesterol levels. Dr. Tontonoz is currently working to determine whether inhibiting IDOL activity with small molecules or molecular biological approaches may reduce LDL levels and risk for cardiovascular disease.